Previous post in this series: How to Use Web Search Trends In Your Fundamental Research Workflow: Beat or Miss? In our last blog post in this series, we talked about predicting a beat or miss with search trends. But there are situations where the data may not work as easily as with that example. So how can you sift through all of the data to find those situations? 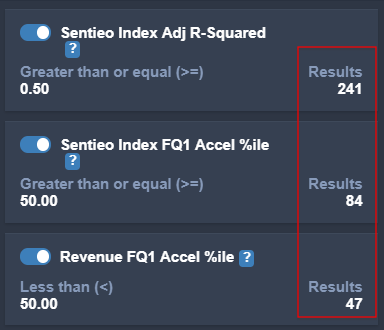 Sentieo’s Screener lets you filter from thousands of stocks down to more manageable lists of names to do further work on. The steps below will use the Sentieo Index, a weighted average of alternative datasets that varies by ticker. Now perhaps we want to see where these companies are diverging vs. consensus expectations. Let’s try using our acceleration ranks. This is just a number from 0 to 100, where (>50) means that the data had a positive acceleration, while (<50) means a negative acceleration (or a deceleration). We can simply look for cases where the Sentieo Index is accelerating, with Revenue growth expected to decelerate. It’s important to sanity-check these numbers by going into the charting interface. If we look closer for $ZEN, we can see that the Sentieo Index suggests an acceleration, while consensus expects a revenue growth deceleration. Screening is important when harnessing the power of alternative data. It is impossible to manually sift through data trends for each of the thousands of companies that we cover. Screener will help focus your efforts to a manageable list, so that you’re finding the best opportunities and prioritizing your time accordingly. The Adidas ($ADS) Brand: Climbing Up or Decelerating?